At Summit Station, the turnover schedule during winter can resemble a moving target, subject to change upon change upon change, usually due to weather on the ice cap. But yesterday, despite brisk temperatures at the station, one could have set her watch by the timing of the turnover flight, which brought a new crew and fresh freshies to the U.S. National Science Foundation-funded research station at the apex of Greenland's ice sheet. "All was smooth and flawless," Ed Stockard reports. That's a fitting end to a winter phase notable for its harmony (if you don't count the optical lollapalooza lighting the sky). 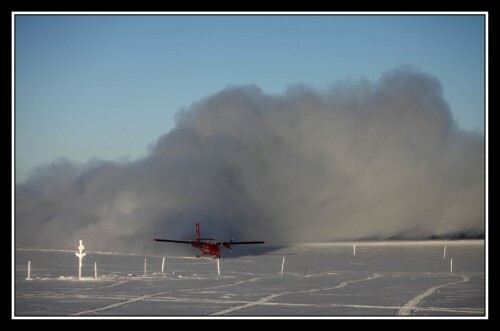 "Phase 1 mechanic Will Beyer had the fuel sled ready for the plane," Ed continues." The science techs—Katrine Gorham, Adam Maerz and Matt Okraszewski—were our ground crew operating snowmobiles and taking care of passengers and cargo. I got to play control tower dude. Despite near -60 temps and massive amounts of machine-induced ground fog all went well and in about an hour's time the plane had come and gone. There went our peace and quiet! But in came our salvation for a timely parole! The next flight is ours!" Summit Featured on Atmo Optics!